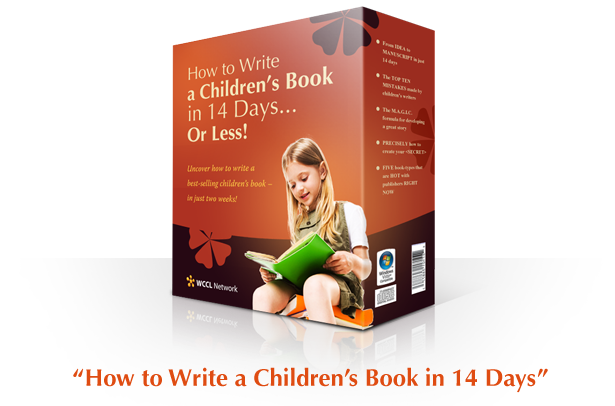 Write YOUR Best-Selling Children’s Book – In 14 DAYS! Uncover the SECRETS of Writing a Kid’s Classic QUICKLY - Working Just 2 Hours a Day, for 2 WEEKS – OR LESS! Ever dreamed of writing a BEST-SELLING CHILDREN’S BOOK? You stroll into the store and see your books proudly filling the shelves. Children are opening the pages – and you watch as each individual imagination lights up. Feel proud: You’re a children’s author! You’re following in the same footsteps as Terry Pratchett, Roald Dahl, Beatrix Potter, Enid Blyton – and many thousands of other modern authors. And it feels even better when those royalty payments hit your bank. Thousands upon thousands, in honour of your words. You're amazed, and on an all-natural high. Does THAT sound like something YOU would like to try? YOU can go from initial idea through to final manuscript – in just 14 days, or LESS. YOU can become a children’s author, and write a best-selling children’s book, in just two simple weeks. And, TODAY, I’d like to show you how. Here Are the Reasons You HAVEN’T Written Your Book! From Procrastination to Plot Problems, Discover How to BLAST Through It All - With This SECRET Writing System! Hello! I’m children's author Mel McIntyre – and welcome to this website! I’ve spent the past 20 years working as a professional writer. I’ve had children's stories, articles and poetry published the world over. I've worked as writing advisor to some of the best in the business. And in the non-fiction world, I'm the author of books such as "Travel Writing Secrets" and the man behind the Amazon best-seller plan. More recently, I’ve just landed yet another personal book deal – this time for four new children’s books. The first in the series, Flutter Bunnies, has just been released. I also have another children's book "The Legend of Lumpus & Ogols" due out at the end of this year, with illustrations by David McQuillan. Yes, I know about writing children’s books. And there’s no doubt... It can be TOUGH. Maybe you’ve found that already. But why is writing a children’s book so hard? “Hey Buddy – I just DON’T have TIME!” – Sounds about right. You’ve tried and tried, but you just NEVER seem to get round to actually starting (or finishing) that children’s book. Sound familiar? “Ugh. I’m having MAJOR trouble with the PLOT!” – Sometimes you think you have it right. You try to copy Harry Potter. Then it goes wrong, and you start again. Trying to figure out what children really want is DIFFICULT. “PROCRASTINATION... Because...” – Maybe you’re worried about wasting your time. Or finding a publisher. Or having friends review your work. Or just not doing a very good job. Procrastination just STOPS you. But what if I told you there was a SECRET SYSTEM for quickly writing your own children’s classic... taking it from BASIC IDEA to PUBLISHER-READY MANUSCRIPT... in just 14 days, OR LESS? A system that blasted through writer’s block. One that induced absolutely zero-stress. One that GUARANTEED to get you published, without question. Doesn’t THAT sound like a SECRET SYSTEM you’d be interested in? Well, get ready. Because IT EXISTS. Discover the SECRET SYSTEM Used By Top Authors! Learn EXACTLY How You Can Write a Children’s Classic - And Have Your Final Manuscript Ready in JUST 14 Days! For years, the world’s greatest writers have followed a SECRET SYSTEM. It’s a system that enables them to write well – and write QUICKLY. And YOU don’t know about it! Take Nick Daws. He’s written over 80 books, and publicly admits that the majority took just a couple of weeks to complete. Karl Moore wrote each of his four recent best-sellers in less than a week each. James Lamberg and Sylvester Stalone wrote their screenplays in just days. Richard Carlson’s “Don’t Sweat the Small Stuff” was written during a 12-hour transatlantic flight. Charles Dickens wrote “A Christmas Carol” in just 2 weeks. Barbara Cartland wrote each of her books in a quick 5 days. Yes – THESE writers know the SECRET of WRITING QUICKLY. Now, for the first time ever, I’ve totally customized this system of writing quickly – to bring you a precise, step-by-step ROADMAP for writing YOUR children’s book, in just 14 simple days! That’s right: 14 days and your book is FINISHED. Working an average of just a couple of hours each day, tops. NO big delays. NO plot worries. NO find-a-publisher concerns. NO stress. Just a simple, 14-day system that obliterates procrastination – and takes you right from START to FINISH. Take a SNEAK PEAK Inside This Amazing New Course! From Suspense to Storylines to Secrets & MUCH MORE! Without doubt, this course is a true REVELATION. Inside “How to Write a Children’s Book in 14 Days,” you’ll learn the PRECISE STEPS you need to follow to GUARANTEE a best-selling children’s classic – in under two weeks. From plot development to outlining, from illustrations to publishers, I’ll show you EXACTLY what needs to be done to write your children’s book – in absolute record time, using the best tricks taught by my colleagues, Nick Daws and James Lamberg. Trust me, if you WANT to write a children’s book – THIS is the place to begin. It’ll show you how to write books for ANY audience, with a particular emphasis on that “golden age of reading” – 8 to 12 year olds. So, would YOU like a peak at some of the awesome information covered inside this powerful course? From IDEA to MANUSCRIPT in just 14 days – The step-by-step plan you NEED to know, and how to do it all working just 2 hours per day! The TOP TEN MISTAKES made by children’s writers – And the simple steps you can take to avoid them, for good! PRECISELY how to create your <SECRET> – Use this simple trick, and you’ll NEVER have writer’s block again. Your book will almost write itself! FIVE book-types that are HOT with publishers RIGHT NOW – Follow these little-known trends and you’re ALREADY ahead of 99.9% of children’s authors! Five SECRET JOURNALS found in your public library – And how they review new and up-coming books, so you can keep up with what’s in right now! The TWENTY BASIC PLOTS for your story – Struggling with writer’s block? Every story fits within these twenty basic plots. Just pick yours from the box! The GENRE SELECTOR for choosing your story style – Never be lost for the type of story to create again! Just use our GS machine! What kind of VOCABULARY to use in your book – And how to select the right point-of-view for your writing. This can make or break your work! How one LEADING CHILDREN'S AUTHOR creates her multi-million dollar settings – Sometimes less is more. Learn how to create multi-sensory scenes in just a few words! SEVEN essential characters found in every children’s story – Alongside the examples you need to bring these characters to life! The SUSPENSE GRAPH model, and how to use it! – The all-time best-selling books follow THIS simple model. Make sure YOURS does, too! TEN top tips for writing an IRRESISTABLE OPENING – Alongside the amazing examples that will just BLOW you away! Amazing METHODS for writing awesome genre fiction – THREE points to remember when writing mysteries, 5 tips for horror, & much MORE! The SIMPLE TRICK to making your characters truly THREE-DIMESIONAL – You’ll love this one, and most authors never share it with you! The “POWER OF 3” – It may sound curious, but this is essential to the success of your children’s story. IGNORE this at your peril! How to create DIALOGUE that keeps readers GRIPPED – There are differences when writing for children. Learn about them here! Sneaky EASY WAYS to EDIT your book, quickly – Stop glazing over, reading the same page again and again. Follow our guide to getting edited, quickly! How to gain FEEDBACK on your book, for FREE! – Don’t just give it to relatives. We show you how to gain free feedback and make critical improvements! The ONE THING you MUST do with your manuscript – As soon as you’ve finished writing, DO THIS simple thing. If you don’t, you will waste a LOT of time! And this is just a TINY PREVIEW of what you’ll find inside this powerful course. Would YOU like to try it out for yourself? PLUS: Discover HOW to Bag Yourself a Publishing Deal! Need an Agent? Should You Self-Publish? What Next? No Worries, We Share EVERYTHING You Need to Know! 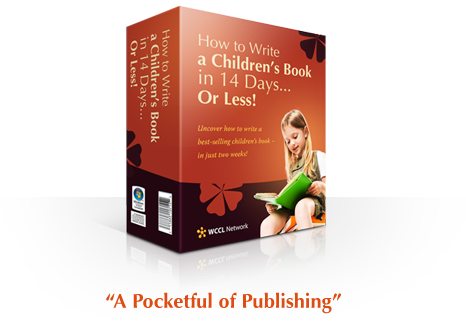 Are YOU ready to discover how to write YOUR children’s book, in just two weeks? This course unveils EVERYTHING you need to know to get your classic written and ready for the world. The feared publishing trawl? An endless stream of Stamped Addressed Envelopes? Enough rejection slips to repaper your office? Desperately trying to find an agent? I’ll solve ALL of that for you. Inside the pages of this awesome bonus guide, you’ll be shown PRECISELY what to do next with your book. I’ll show you EXACTLY what to do next, to help GUARANTEE your book gets published PRONTO. How’s THAT for a helping hand? There’s NEVER Been a Better Time to Own This Course! PLUS: Claim Your FREE Bonus Guides to the Best Books And an EXCLUSIVE Behind-the-Scenes Author Interview! Ready to discover this ENTIRE COURSE? You can now purchase this entire course, and get instant access via email, for ONLY $89.95. SPECIAL OFFER: NOW ONLY $59.95! This site has NEVER offered “How to Write a Children’s Book in 14 Days” as cheap as this before. Order today - Wednesday - and you’ll get the full course for just $37. It’s an unbelievable -- and totally unrivalled -- offer. Not only that, ORDER TODAY and you’ll also receive a bundle of very special bonuses, too. This is my own personal rundown of the very best children’s books around, and what made them so great. Learn from the biggest sellers out there, and copy their techniques! Uncover the truth behind my own success in the world of children’s books! From the struggle to grab my first publishing contract to words of advice for up-and-coming authors. This is a very revealing look at a real writer’s life – and one that will amaze you! All of these, alongside the main course and publishing bonus – ALL FOR JUST $37. Ready to TAKE ADVANTAGE of this deal? Click on THIS BUTTON to start your career as a well-known children’s author... TODAY! Access details will be delivered via email immediately after purchase. Discover the ULTIMATE Children’s Writer GUARANTEE! a Leading Publisher – Or You’ll Receive EVERY PENNY Back! But wait – the deal gets even better. That I’d like to offer you the ULTIMATE GUARANTEE. I absolutely certify that if you give this course a fair chance, you’ll be holding your final manuscript in just two weeks from now. Not only that, I guarantee that it’ll be of such good quality, that you’ll have interest from a publisher WITHIN the month! Now how’s that for a fantastic guarantee? And if you aren’t ABSOLUTELY THRILLED with the results, we’ll refund every penny you paid! All we ask is that you try out the course for at least two weeks first. If you want a refund, just get in touch within a month and send us what you’ve done. Then we’ll not ONLY refund you – we’ll also give you advice on continuing your writing elsewhere, too! Best of all, this total refund guarantee is backed by the Global Writing Network – so you can be sure your money is safe. Full Course, Bonus Guides, Guarantee, Life Support & MORE! You’re about to become a SUCCESSFUL CHILDREN’S AUTHOR. This guide is PRECISELY what you need to overcome your procrastination, and write your very first children’s book – in under two weeks. This step-by-step process of writing quickly will astound you. You’ll be amazed at how you can produce such high-quality work in such a short space of time. And you’re going to LOVE the publishing contract and acclaim you get at the end. This is the main 180-page course, taking you day-by-day to creating your first children’s book. Learn the secrets of writing quickly, uncover how to create a winning plot, discover how to design characters that kids will love – and much more. This is EVERYTHING you need to know to create an amazing children’s book, in just two weeks - or less! What do you do once you’ve written your book? This guide shows you the way. From agents to publishing houses, query letters to self-publishing, synopsis to “SAE Hell.” I’ll hold your hand through the rough spots – and help you land a publishing deal that works for YOU. What books sell like hot cakes? And which are real flops? Check out my rundown of the greatest, best-selling books out there – and learn what makes them tick. Then copy their strategies to create your own children’s classic! Take a sneak peek inside the life of a real children’s author. Learn everything, from landing that first big break to dealing with publishing houses. Pick up the tips you need to know to survive in the curious world of children’s publishing! NO surcharges and NO small print! Just give the course a fair trial and let us know how you get on. If you don’t get your final draft completed within two weeks, or don’t get interest from a publisher within a month, you get every penny back. Total security! Got questions? Need assistance? Our support team are around to handle any publishing questions you may have. Need help with a publisher? Get in touch. Not sure about a genre? Get in touch. We’re here for YOU. For LIFE! “The time has come,” the Walrus said. YOU finally have everything you need to put finger to keyboard – and create your own best-selling children’s classic. The prestige of being a published author. The pride of seeing your book on the shelves. The joy of having a child read your work. The pleasure of banking a beefy royalty payment. YES – YOU are about to become a children’s author. Following in the footsteps of Terry Pratchett, Roald Dahl, Beatrix Potter, Enid Blyton – and many other fantastic writers. It’s EASY. It’s QUICK. And it’s FUN. And the only thing between you and true success right now... is one simple button. Begin the journey. Have YOUR manuscript finished within two weeks. I wish you every success in your writing! PS. This course has NEVER been offered at such a low price! This is the lowest we’ve ever made it available. That means there’s NEVER been a better time to buy. So take full advantage – and click here to grab your copy, today! PPS. You WON’T find this course for sale anywhere else! Not on eBay, not elsewhere online, not in stores. It’s fully up-to-date for 2019, and can ONLY be bought online at www.write-a-childrens-book.com. So CLICK HERE and own your copy, right away! PPPS. Writing your children’s book can be SO EASY! Most people never get started, because they simply don’t understand how QUICKLY and stress-free the whole process can be. You’ll LOVE it – but ONLY when you use the 14-day step-by-step process to make it all happen. Give it a go for yourself under our guarantee. You’ll be AMAZED. Click HERE! Home | Affiliates | Contact | BUY NOW!